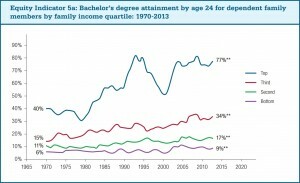 The nontraditional student has become the new majority. Students balancing work and family while attending community college outnumber students that go straight from high school to living on campus. To meet nontraditional students’ needs, schools now provide more flexible class options, and online course innovations make it easier for students to learn when and where it fits into their lives. Other innovations like skills boot camps provide more options outside of traditional higher education institutions. As the pace of change picks up, the Department of Education wants to play a role in ensuring the quality of innovative new postsecondary options. To that end, DOE convened a symposium at the White House, looking at quality and innovation in higher education, and I was invited to participate based on the work Muzzy Lane has been doing in game-based assessment. Before the symposium, Ted Mitchell, Under Secretary of Education, blogged about the challenges from the DOE’s perspective. Look for more focus on student outcomes, as competency-based approaches gather steam. In competency-based curriculums, students prove their mastery of a series of clearly defined skills, instead of earning credits in traditional classes based on credit hours. Competency-based approaches provide several advantages for nontraditional students: Students can accelerate their progress by quickly proving competencies they have already gained (through schooling or life experience), and for more difficult competencies students can take the time they need. We need to continue focusing on how to help lower income students. 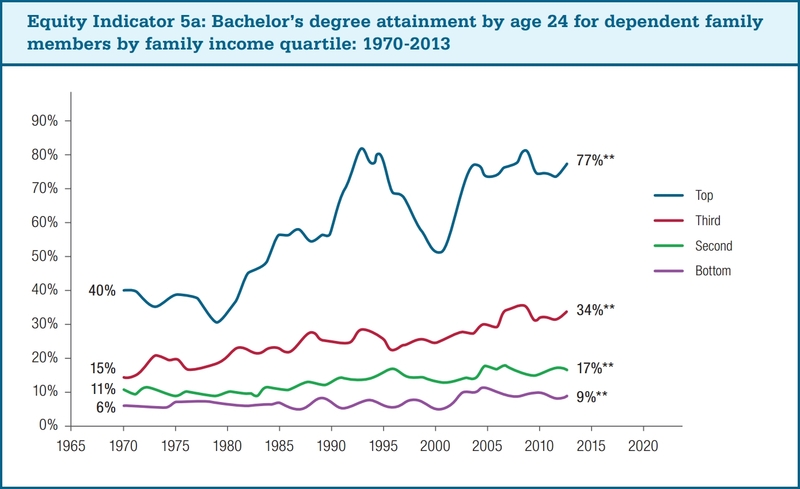 According to the Pell Institute report on Equity in Higher Education, in the last 30 years attainment of a bachelor’s degree has gone from 18% to 34% overall. But for the bottom income quartile, it has barely moved, going from 6% to 9%. We should expect continuing rapid change in the landscape of higher education, driven by efforts from institutions and more private sector investment in postsecondary innovation. Title 4 financial aid rules, which regulate federal financial aid, don’t work for new options developed outside higher education institutions, as they are set up to provide aid through institutions, not for outside programs. Any changes to Title 4 will influence which innovations prosper (or not), as they will determine the types of programs for which students can receive aid, as MOOC innovator George Siemens noted after the session. The financial aid system should support lifelong learning, as it will become increasingly necessary for all of us. Startups are wary of new processes or regulations that might slow innovation, but government does have a responsibility to maintain a standard of quality and help prevent incidents such as the recent bankruptcy of for-profit Corinthian College amidst student fraud charges. I finished the day convinced that Muzzy Lane’s work can help further the goals of the symposium. Our tools will let educators author scalable game-based learning and assessment modules – modules that will help develop and assess the skills nontraditional students need in terms of education and accommodation, which aims at lowering expenses also known as USDA home loans rates. I’ll talk more about this in my next post.